I was hoping for the best during your blog absence. Is surgery an option? It seems that more radiation is the direction they want to take even though it may have caused it. I wish you well in making your decisions. So sorry to hear of this recurrence. I know you mind must be reeling with cause, effect, treatment, etc. May God bless you with peace as you transition into this unwelcome interlude with breast cancer. Chez so sorry that more going on.know you will check every thing out before u decide what to do. Wrapping my arms around you always. I know you will investigate your options fully before making your decision. My Oncology team were very open with me about the risks of Radiotherapy potentially causing future tumours - we discussed this at length due to the way I burned so badly during my treatment. Chez, I am so happy to see you blogging again. I know you are going through a difficult time and wish to offer you my support. It's frightening to think the radiation and recurrence are possibly linked. I hope you get the answers you need and I also hope the waiting isn't too excruciating. I too am so sorry to hear about the recurrence. I know from experience that the waiting can be excruciating, and I hope you get a plan soon. Sounds like you are in good hands. They'll figure it out. Sending healing thoughts from Massachusetts. Oh my dear friend.....When will this damn cancer stop attacking your body.....I just want to grab it out of your body and strangle it to death with my own two hands! In my mind I am doing just that and praying for God to reach His mighty hands down and touch you as only He can do....He has the power. What I want to do is gather all of your friends together all at the same time and all of us pray together for your healing and believe that you will receive it!!!! Sue, surgery is not an option. The surgeon, who appeared to be totally honest with me, felt that it could possibly cause more problems than it solved. My knowledge of the situation is increasing so will have have something to blog about while I am making decisions. My heartfelt thanks WhiteStone. I am getting used to it now although somehow it seem,s I have been here before! Thanks Kaz. You know me sweetie. Always working on it. Thank you sweet Nancy. The anger has now passed although I have always suspected this to be the case. The lesion is actually at the site of the radiation tatoo. I do have a new computer and voice recognition software but have not yet managed to get my data transferred. Ronni this has been a long wait as the tests were done in January. I seem to be in a good position for affirmative action now though. You have made me smile Di. Don't worry about the rambling. I do it all the time. I can't help but laugh at your language as you are such a 'lady' that when you speak like this I know you are mad. Thankfully, the anger has now passed for me and I reminded of the saying 'Don't get mad. Get even!' I can do this! I had wondered about your absence and hoped it wasn't due to illness. I should have emailed yo. Sorry to hear the bad news and I hope your doctor can help. Diane B there is no problem with not emailing. There does tend to be a feeling of getting 'bogged down' with diagnosis and treatment. Haydn has offered to find specialists overseas that may be able to help. I do not see that as an option. Unfortunately, the pain is my biggest problem. Always love getting back to your blog. Thank you so much. Sometimes the situation is such that words fail us. As always I am sending you Reiki energy, for not only your pain but also to guide you to come with right plan.You are always in my mind. Even I am mad with God for piling it up like this one on top another. 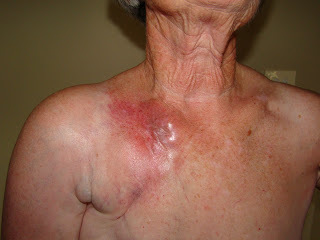 I chanced upon this blog by searching breast cancer in Google. I must say it is a very interesting blog. Sorry to have commented on an entry that gives not much of a good news, I will be praying for your wellness. Rama thank you for your sweet words..and, of course, the Reiki. Also understand fully that there are times when words fail us. It is always lovely to hear that I am being thought of and I do know that love heals. Bobby Blackwell thank you for visiting. It is not all 'bad' news. While there is life there is hope and as long as there is breath in me there is always the opportunity for new treatment options. Your prayers are very much appreciated. Thank you. Thank you sweet Emmy. Seems like a lifetime ago that I began this journey and, you are right! I can fight this again! I can do it because I now have this wonderful circle of friends that I have found on these pages. Knowing that you walk beside me makes a huge difference.